On June 27 Gov. 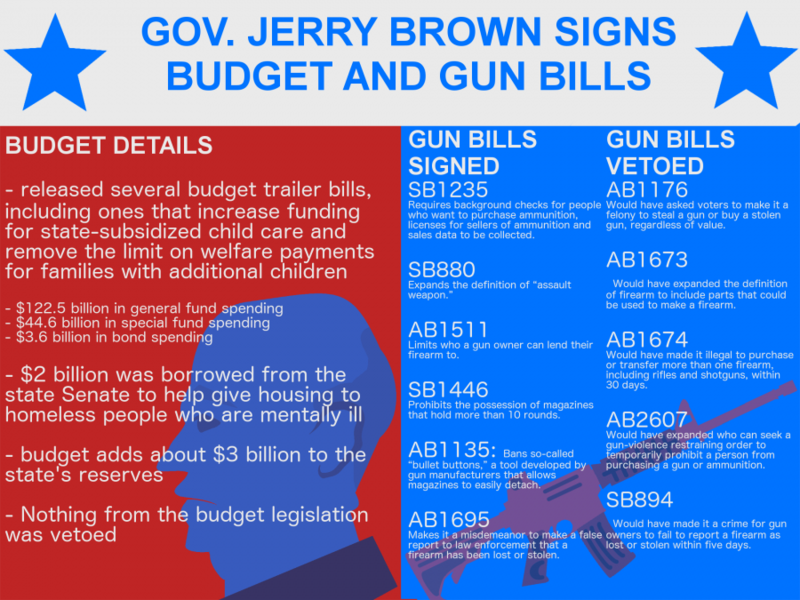 Brown signed the 2016-2017 state budget, which has increased to nearly $170.8 billion from just over $167.5 billion in 2015-2016, according to the California Department of Finance. Then last week, the governor signed six gun-control bills into law after a recent string of shootings throughout the United States with automatic and semi-automatic weapons. Despite the $3 billion extra dollars for the state, colleges and universities didn’t see much of a financial boost. According to the budget, higher education funding in the state increased from $14,862,085 last year to $14,632,795 this year, just a little more than a $200,000 increase and only 8.7 percent of the entire budget. The total funds, $9,357,352 for the 23-campus California State University system, includes $3,223,425 from the general fund, special funds and selected bond funds while the remainder includes federal funds, other non-governmental cost funds and reimbursements, according to the budget. The 2015-2016 CSU state budget was significantly less, at $8,902,622. The total number of positions within the CSU system increased from 44,483 to 46,608 last year, with 144,021 total positions at all California colleges and universities, up from 137,115 in 2015-2016. The budget listed three major program changes that were awarded over the last two years. The first is a $12.5 million increase in order to increase enrollment by at least 5,194 full-time students from 2015-2016 to 2016-2017. The second is a $35 million increase based on a one-time contingency that states the CSU Trustees adopt plans and timeframes for graduation rates that meet the state’s expectations, which are currently undetermined. The last change was an increase of $15 million to the general fund for use determined by the Trustees and an increase of $1.1 million for support of the CSU Student Success Network, led by faculty, staff and administrators across campuses, and administered by the Education Insights Center at CSU Sacramento. Gov. Brown’s busy summer continued on Friday when he signed six gun-control bills that included a new law requiring anybody who purchases ammunition to undergo a background check, something that you only had to be 21 years old to do prior. The governor didn’t approve all of the gun bills; he vetoed five of them, including a law that would have made it legal to use restrain ing orders to take guns from people labeled “dangerous,” according to the governor’s office. Gov. Brown told reporters his intentions were to increase public safety and protect the rights of gun owners.